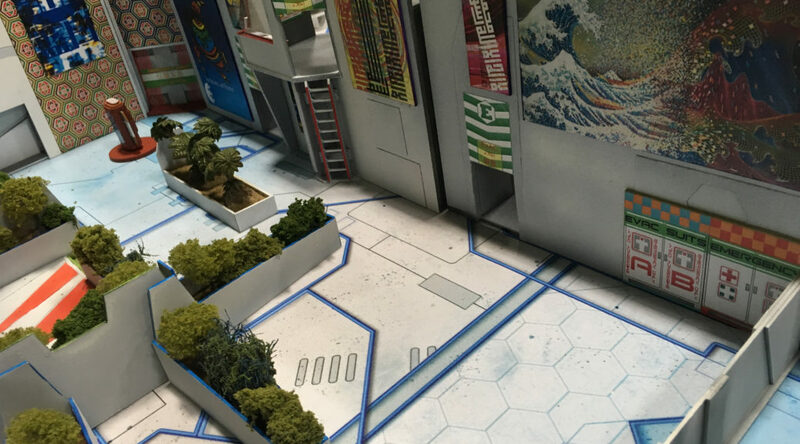 I managed to escape from Trumpeter Salute 2017 at the start of April without buying a single actual figure, but I brought home a batch of scenery bits and pieces and some reading material, at least. The haul from Trumpeter Salute 2017 all laid out. Click for larger. It helped my wallet that Bob Murch of Pulp Figures wasn’t there, and neither was Uncle Mike of Uncle Mike’s Worldwide/Strange Aeons. The excellent folks of Imperial Hobbies did help lighten my wallet and bulk up my luggage a bit, at least, although winning a pair of their $20 gift certificates in the very generously supplied door prizes offset the wallet-lightening a good bit! 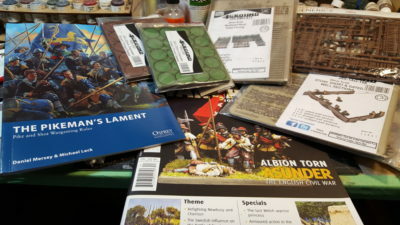 The centerpiece of my acquisitions are the Pikeman’s Lament rules from Osprey, to finally put my long-neglected English Civil War/Thirty Year’s War figures to use and get them some time on the table! Related to that I snagged Issue #87 of Wargames, Soldiers, and Strategy, their ECW special, which has some great articles including an excellent building how-to by Tony Harwood that I’m going to be doing my own version of sometime soon. The rest of my Trumpeter Salute acquisitions were scenery, almost all from 4Ground. Short & Gated Stone Wall Sections, Weathered Picket Fencing, two packages of 25mm bases, and finally Renedra’s Palisade Fencing package to round out the set. I’ll be doing proper review articles on the 4Ground and Renedra fences & walls sometime soon; those posts are already being drafted. I headed over to Vancouver for my annual pilgrimage to Trumpeter Salute again at the very end of March. My girlfriend and I decided to tie it in with a road trip the week before to visit my folks a few hours inland from Vancouver and her folks up on the Sunshine Coast just north of Vancouver, which had the affect of making sure I was tired even before Trumpeter weekend started! Regardless, it was a great show. I’ve been going for eight or nine years now, with one or two gaps, and there’s a number of folks I only ever see at the Trumpeter Salute show every year that I look forward to reconnecting with and seeing what spectacular gaming projects they’ve been up to. This year we started off on Friday night with some 15mm WW2 Eastern Front action, leading a German mix company to a really marginal victory against the Russians. 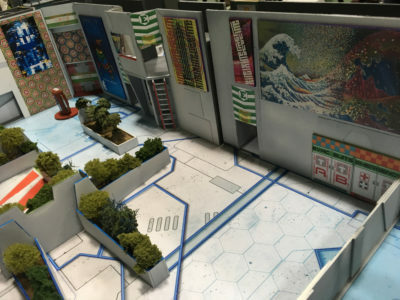 No photos of that, unfortunately, which is especially sad as Troy runs a spectacular looking game and each vehicle and infantry stand is a tiny work of art! Saturday morning we started off by borrowing Martin’s son’s Star Wars Lego collection to run a good sized Star Wars Lego Battle of Hoth, complete with AT-AT, snowspeeder, and a fierce Bantha! 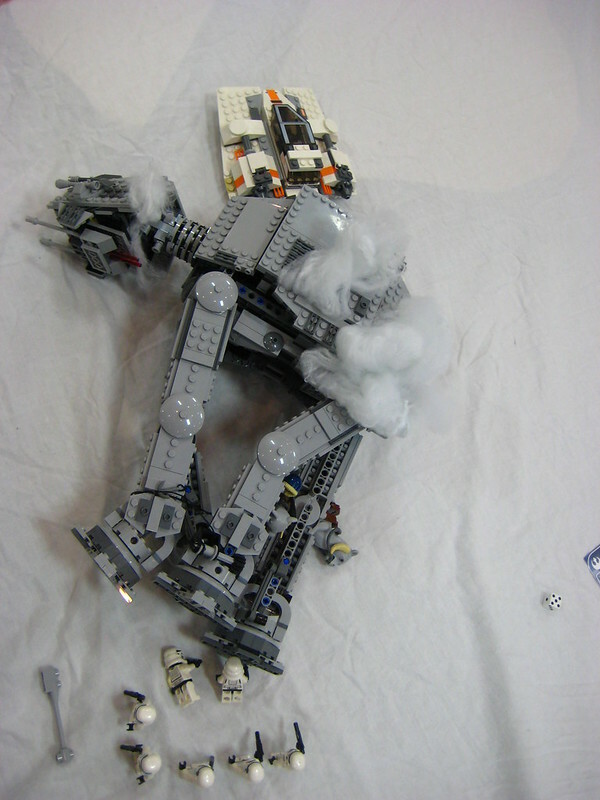 Luke in his snowspeeder managed to bring down the AT-AT, but when he went back out to rescue the pinned-down Wookie squad, Darth Vader managed to capture him (and Han!) in the middle of the snowfields. 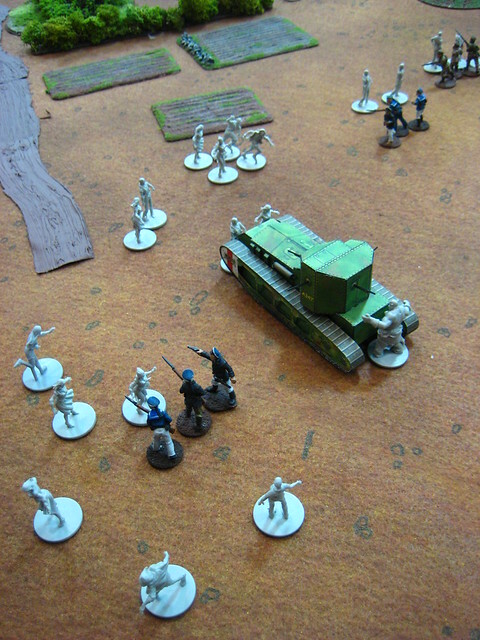 Saturday afternoon we ran a 1980s air war scenario based on the Iran-Iraq War. The Iranians had all American fighters, including the F-14 Tomcats the Shah had purchased before the Revolution, and the Iraqi Air Force had then-new MIG-25 Foxbat fighters, straight from the USSR. Unfortunately for the Iraqis, Iranian luck and high tech American missles meant it rained Foxbats and parachutes into the Persian Gulf all afternoon! 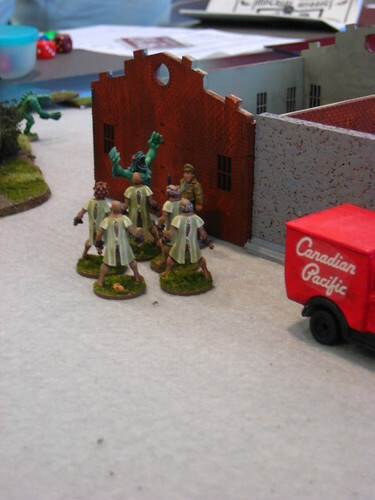 Meanwhile, this spectacular Vimy Ridge game was being put on by the White Rock Gamers. 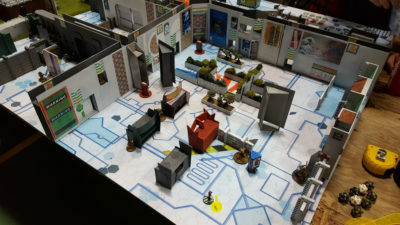 Sunday I ran a Pulp Alley game with six players. There were three groups of fishmen, a Miskatonic University research team, a team of human cultists, and a mad scientist all competing to find or recover a lost Treasure of Dagon! 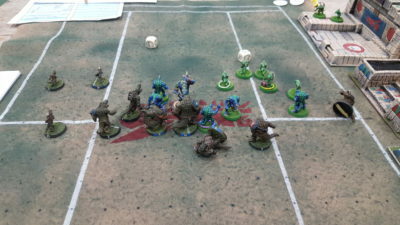 Lots of action and pulp hiliarity ensued, ending in the cult leader blasting multiple other characters with terrible occult power and preventing the recovery of the Treasure. There are a bunch more photos – 18 in all – over in my Trumpeter Salute 2017 album on Flickr. Enjoy! Bit quiet around here but I’ve been busy painting up a storm for my Trumpeter Salute 2017 game! “The Faithful of Dagon” will feature several competing sects of fishmen, some human cultists, and various other factions all competing to recover things Man Was Not Meant To Know, all powered by the Pulp Alley rules. Look for it Sunday morning at Trumpeter Salute. I’ll get the WordPresss app reinstalled and running on my smartphone before Trumpeter and try to show off some photos and such from the show, but I’m on a holiday road trip right until Friday when I rock up to Trumpeter, so posting is going to be light until then. 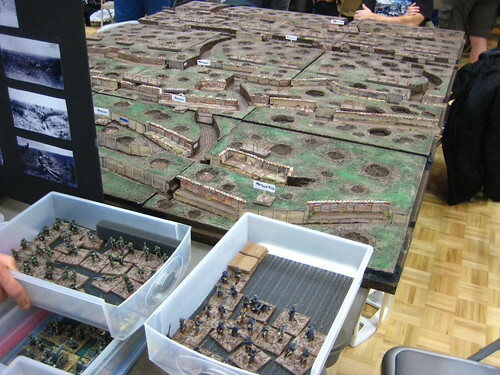 See you at Trumpeter, hopefully, and hope March was a productive wargaming month for you like it was for me. Finally got my Trumpeter Salute 2016 photos off the phone and onto Flickr a few days ago. The full collection is over on Flickr but here’s a few favourites and highlights! 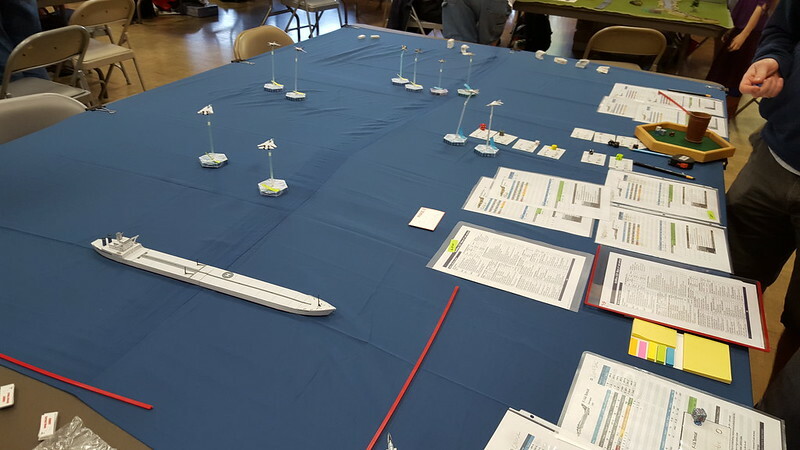 Saturday morning we ran a Libya vs US Navy air war scenario, based on an amped-up version of the real Gulf of Libya incidents in the mid-1980s. The Libyan MiGs humiliated the US Navy Tomcats, shooting down two and barely losing any aircraft, while blowing up the oil tanker they had come to strike! I didn’t play in this one, but it certainly caught my eye. 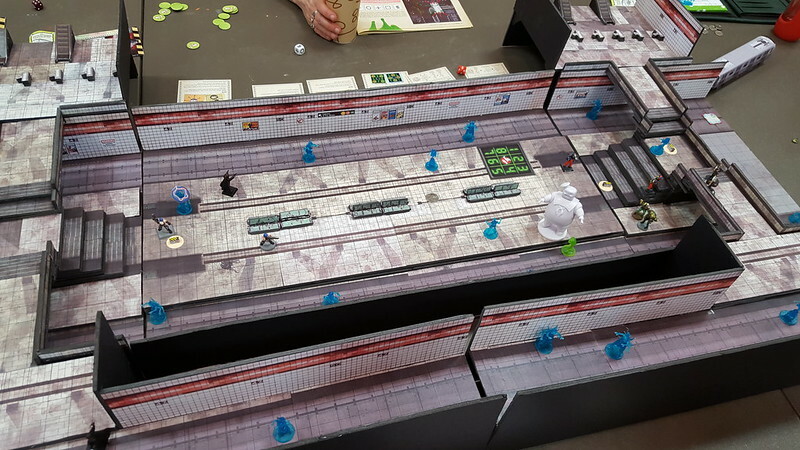 Rival teams of Ghostbusters (they’ve become a franchise, apparently) try to clear a haunted subway station. 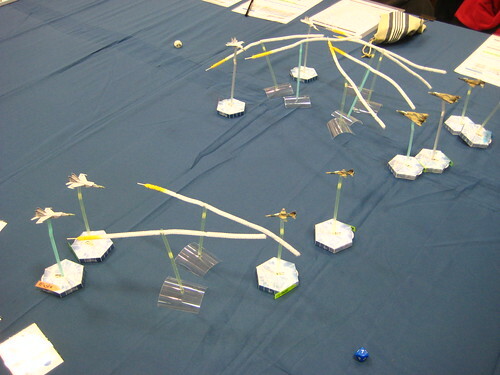 This was one of Lisa’s games, she always runs awesome creative games that are very welcoming to gamers of all ages! 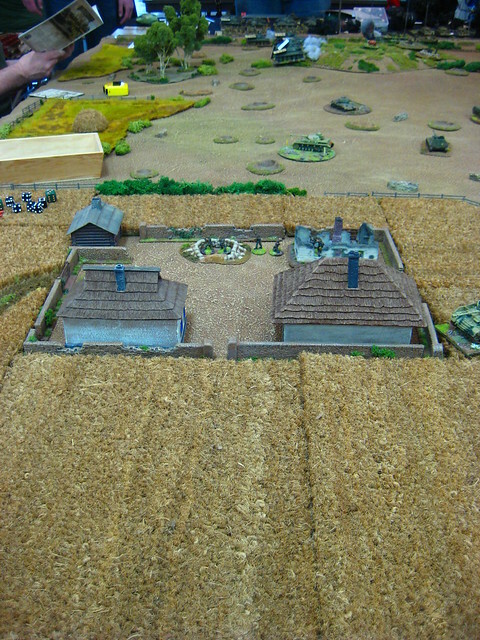 Another 1980s based scenario for Saturday evening, this time using Martin’s awesome 6mm hex terrain to do a complex West German vs Soviet scenario. Soviet air-landing battalion vs West German home guard, then a counterattack by West German armour that runs into a spearhead group of Soviet armour coming to relieve their paratroopers! Great game and a decisive Soviet victory. Sunday I ran a big Pulp Alley game for six players. It was somewhere in India after the Great War, and we had rival teams of Thugee cultists (the cult wasn’t as extinct as everyone thought…), various interfering foreigners including White Russians and Red Air Pirates, and two rival British Army Lieutenants each out to prove themselves the best! 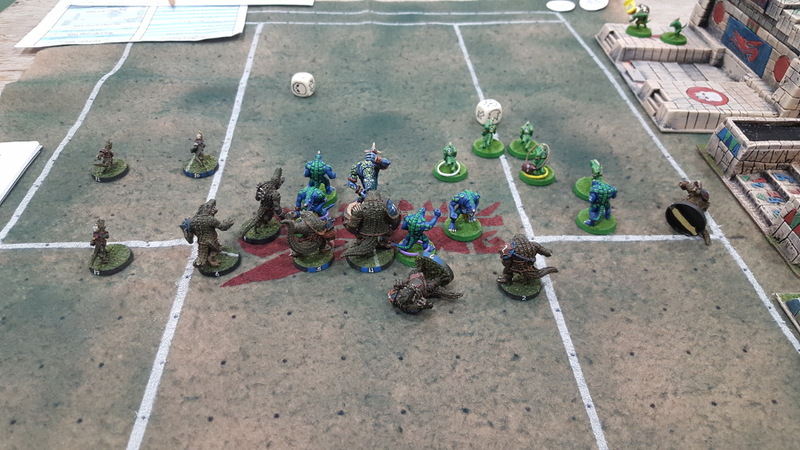 It all ended in a giant brawl in the collapsing cursed temple of Kali, with the Thugee generally being seen as the winners! As always, a great time in Vancouver. It was good to see most of the regulars there and catch up with them, and see all the great games being put on. Until next year! Somewhere along the way the default tabletop setting for a game of Infinity became “futuristic urban/quasi-urban environment”, which is as true of most of our tables locally as it is anywhere else, but the game does have a full and interesting set of terrain rules and even tries to include things like zero-g, hazardous environments, and similar. 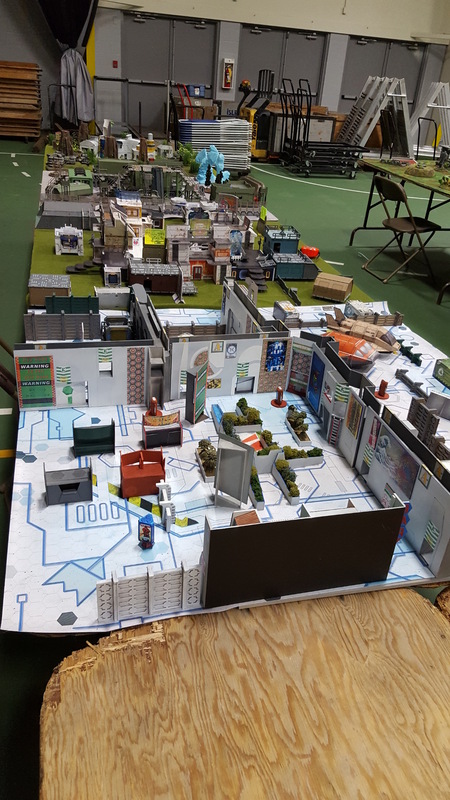 With that in mind, I finally pulled the box of jungle terrain that I’d built a few years ago for pulp gaming out and we set that up for Infinity this weekend for our first tournament event around here. Looking across the jungle toward the Tohaa positions. Click for slightly larger, as usual. 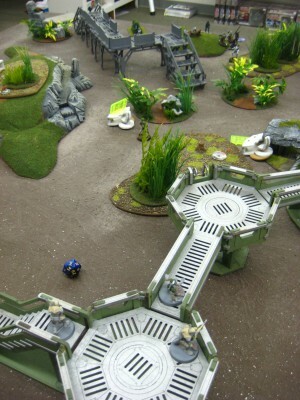 The platforms are lasercut MDF from the collection of one of the other local Infinity folks, and they look good adding a sci-fi touch to the jungle. Jungle is hard to move through, obstructs shooting but does not block it entirely, and makes things like spotting a bit more difficult. 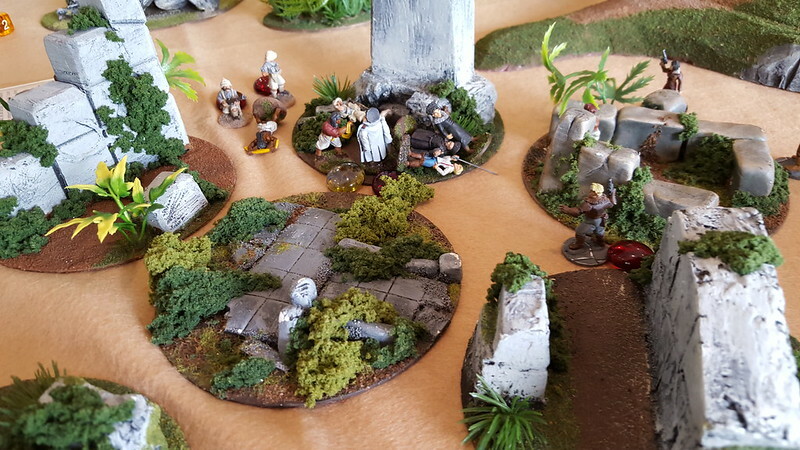 It makes for a great change from our usual urban jungle, and I’ll be taking the box o’ jungle terrain to many more Infinity sessions in the future. The numbers are Wins/Total VP/Total Surviving Army Points. Total Wins determined basic standing, with VP and then Points being used to break ties. One thing I thought was interesting is that only two of us ran Sectorials, with four of the six opting for “vanilla” Faction lists. We’ve got another event scheduled for the end of November, about a month from now, and hopefully we can get a regular round of events up and running locally! Allow me to end with some 80’s hair and music with a highly appropriate title! Finally, Trumpeter Salute 2015 Photos! Realized a few days ago that I hadn’t even taken my photographs from the Trumpeter Salute 2015 wargame show off the camera, never mind looking at them and choosing which ones to publish. This for a show that was at the end of March, three weeks ago and counting! The whole collection is over on Flickr, as usual. Here’s a couple of highlights. We started off with “Russian Civil War + Zombies” or “The Undead Are The Ultimate Proletariat”, which was fun and silly even if All Things Zombie isn’t my favourite set of rules. I got to blunder around in this great papercraft Whippet tanks, attracting zombies just by leaving the engine idling (thing is LOUD!) and then running them over or machinegunning them. Good fun! 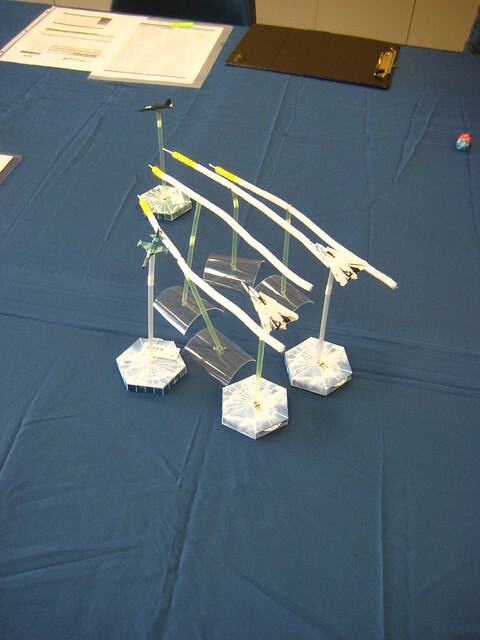 Saturday morning and afternoon were both full of Tomcats, MIGs, and other Cold War planes as we ran two sessions of Air War C21, which is a fast, fluid, great set of rules. Tomcats are scary aircraft. 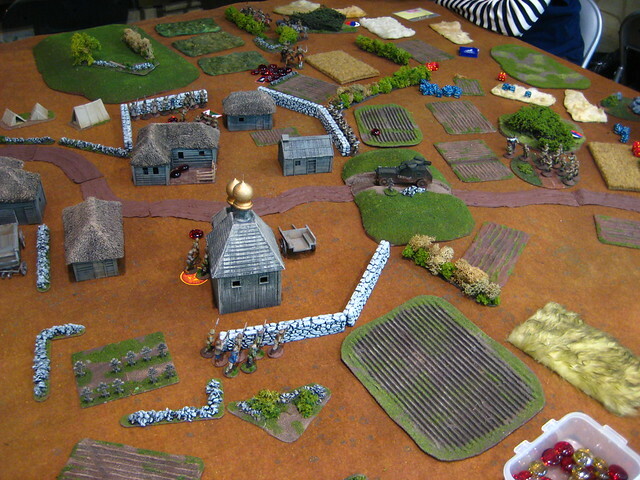 Saturday evening I ran my actual Russian Civil War game for four players. 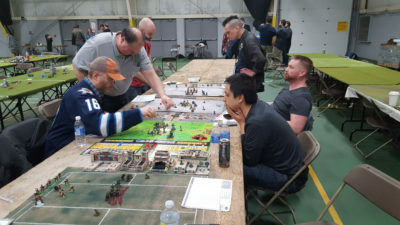 I had two signed up as “spares” and had to turn a seventh away, which is always disappointing but it beats having nobody show up for your games! 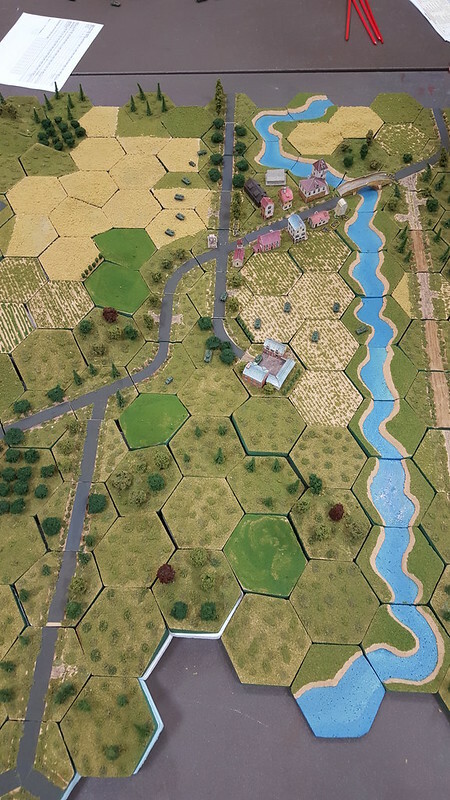 (which I have had happen at GottaCon here in Victoria…) It was a closely fought battle but the Reds succeeded in keeping the Whites out of the village in the end. Sunday at Trumpeter is the long single session, so we get the “big” games out. 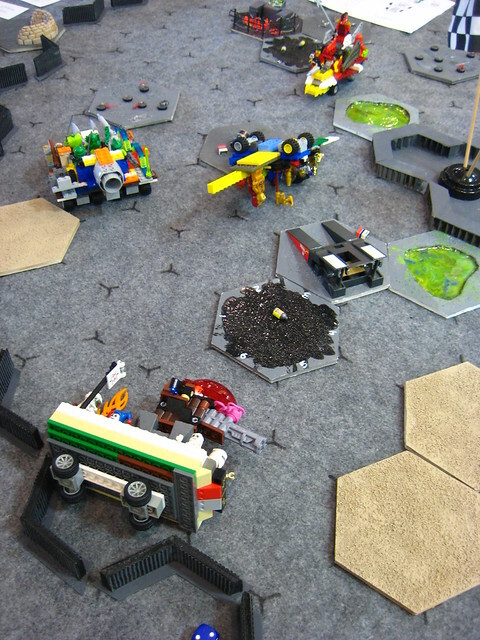 I participated in the gloriously goofy Lego junkyard race game, with half of the other players under 14. The red-and-yellow pointy looking vehicle at the very back of the photo above is my racing machine. Good fun, I can’t even recall who won, to be honest! Next table over was Thomas’ absolutely spectacular Kursk WW2 game in 20mm, hordes of Russians trying to push the Germans out of the Motherland. I spent a lot of time between my racing turns gawking at this game. Already looking forward to Trumpeter Salute 2016. I might bring Russian Civil War back, or I might go back to my pulp gaming and run some sort of pulp adventure game. We shall see! Thanks again to Jon for the ride over, Martin for the hospitality, and the Trumpeter Salute club for putting on another amazing weekend.